Two days later I am still remembering scenes from our school’s recent production of Hairspray. I, along with the whole audience, thoroughly loved the show. From start to finish we were entertained by a cast of 50, singing, dancing and acting with charisma and energy. Such was the positive force of this show that at the end the audience were literally dancing in the aisles. There were many things that impressed me. First it was a collective production. The Year 8s helped to design and produce many of the sets and props. The Music Department, including many of our visiting music teachers, played with such rhythm and soul that we were tapping our feet throughout the show. The acting and singing were superb and the Dance Department choreographed many splendid numbers. And not to forget back stage where the girls manned the sound and lighting deck to give the show real polish. It was also collective in that we worked with many of the boys from Bedford School. We have really enjoyed and benefitted from our growing links with Bedford School and I look forward to seeing our girls act in The Crucible at Bedford School later in the term. Secondly it dealt with an issue which is as relevant today as it was when it was first written – in-crowds and exclusion. The production dealt well with the idea that in our society many people are excluded from being allowed to belong because of their shape or colour. 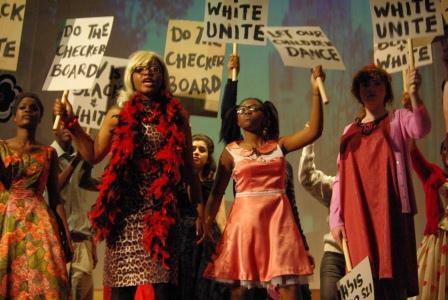 In Hairspray the heroine challenges these stereotypes. She does not have the svelte model figure, but becomes the star of the television programme. She radiates inner self belief that inspires others to be proud. She brings together two segregated communities – blacks and whites through the power of music and dance. Tracy Turnblad is bold. She is an inspiring female role model and I was delighted that the production team were able to bring this character to life and share her story with our pupils and the wider audience. The evening was pure joy: everyone left with a smile on their face, a tune in their ears and a message in their heart and mind about the importance of inclusion and the difference an individual can make to their community. I was very proud of what the girls and staff had achieved.